Adult Funny Games For a Boys’ Night In! Having a boys’ night in? Read our reviews of Adult Funny Games and treat you and your mates to a fantastic evening of beer, chips, girl talk and guys’ games. Boardgame Beast’s picks are guaranteed to raise a lot of laughs. There’s more to a boys’ night in than pizza and football (though we have both bases covered, just in case: see The NFL Finger Football game). There are some really great adult funny games here for your next night away from your better halves. Grab yourself a case or two of beer, unplug the phone and get playing. Japanese TV is weird. The Banzai DVD game, based on a cult TV series, is even weirder. You and your friends can bet on totally weird crap, hone your chopstick skills, and generally get drunk and disorderly in short order. You can never have too many zombies, and among the Best Zombie Games ever is Give Me The Brain. Not many games actively encourage people to speak like the undead. You have been warned, this one’s silly. 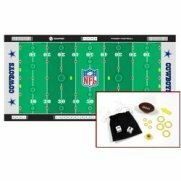 With a set for every team in the NFL, plus a generic one, there’s no excuse not to own one of the best sports tabletop games ever made. NFL Finger Football is surprisingly challenging, and as you get more acquainted with good beer over the course of the evening, things aren’t going to get easier. Take sides in an argument and back it to the hilt. That’s Cranium Party Playoff in a nutshell. The interesting part is, the arguments are random, so you might be backing cheeseburgers over beauty queens. Amazingly fun. A game that was banned due to legal action, the Ghettopoly board game has a cult following and is collectible, so take care if the guys are drinking. Drive-bys, pimps, hos and dope are the currency, and owning the ‘hood is the name of the game. Beat the snot out of kids and steal their cash. That’s the Lunch Money game! Played with cards and cruelty, you will laugh like drains as you pound the nerds. 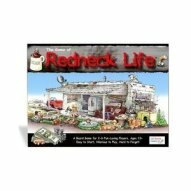 Like the game You Might Be a Redneck, the Redneck Life board game pokes fun at backwoods living. Based on the Game of Life, you must guide your rednecks through similar, though funnier, life choices. As the name suggests, this horse racing board game is REALLY nasty. Especially if you play for real money. We don’t recommend it — even without a side bet, this game has the potential to break up friendships. You have been warned. There’s zombies and zombies, but very few burger-flipping zombies! Lord of the Fries sees your zombies fixing orders, trading cards with other zombies, and cheating, maybe even biting, to win. Answer questions yourself, or back your friends to get a question right. Wits and Wagers will turn any trivia contest into a betting frenzy. Be sure to bring your ATM card. Please rate and comment on any games you’ve played from this selection: each review has Comments link at the end of the page. If your favorite adult funny games are not listed here, send us board game reviews.